One of my pet peeves is recipes that say they will take 30 minutes to cook but not only would it be impossible for a Top Chef to walk into the kitchen and get it done in 30 minutes, it gets every pot and gadget in the kitchen dirty. This makes you feel like a failure when it ends up taking over an hour to cook (not to mention another 1/2 hour to do the dishes). When you dissect the cooking times from even respected recipe sources, it's clear that the clock does not start when you walk into the kitchen; it starts after the ingredient list is assembled: the onion is diced, garlic minced and chicken shredded. Even then, there is sometimes fantasy timing. A couple of weeks ago there was a soup recipe in the Wall Street Journal "Slow Food Fast" column that claimed total time was 50 minutes. When you added up just the cooking times, it was 56 minutes, not including the time to warm up pans or reheat the soup after after pureeing. You might not expect the WSJ to be experts on cooking, but you would at least think they could do the math. So enough of my rant. How do I get dinner on the the table fast? And without any many dishes? One of my secrets is to use the freezer. I freeze soups, stews, and the like in serving size amounts in 1 quart freezer zip bags. I lay them flat to freeze, then they will stack pretty efficiently. To get dinner on the table in less than 15 minutes, I put the frozen bag into a large bowl of hot water until thawed (this takes maybe 10 minutes.. and you don't really get the bowl dirty), then empty the bag into a serving bowl and reheat a couple of minutes in the microwave. Add some garnish (like avocado or sliced green onions) and it even seems special. Some things do freeze better than others. I almost always have Lentil Soup in the freezer. Most vegetable soups are good (like Chicken Noodle or Minestrone), but some vegetables freeze better than others (carrots, winter squash, peppers, green beans, mushrooms, greens, onions are good, but broccoli, zucchini, and potatoes have texture issues). Another trick is that if I am making something to just go into the freezer (as opposed to just freezing the last couple of servings of Beans and Greens when you realize that another day of eating beans will not improve your social standing) is to quickly cool down the pot of soup by putting it into the sink that is half filled with cold water and some ice. The recipe that I adapted from Fine Cooking magazine called for store-bought rotisserie chicken, which I am sure would work just fine (but maybe not fine cooking when you learn what they inject the chickens with). 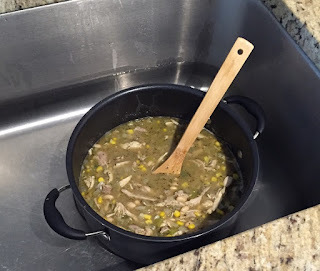 I usually start by boiling a cut up raw chicken with onions and carrots, essentially making broth, pulling out the chicken pieces as they get done, pulling the chicken off the bones, then put the bones back into the broth pot and cooking a while longer for broth. You could also start with left-over roasted chicken (maybe do a half recipe), or some left-over turkey. Garnish (optional): Shredded sharp cheddar cheese, avocado slices, sliced green onions, cilantro, lime wedges, sour cream or Greek or plain yogurt. Heat oil in a large pot (5-6 quart). Add the onion and cook until translucent (don’t brown). Add cumin, herbs, hot chiles, and garlic and cook until fragrant (just a minute or so). 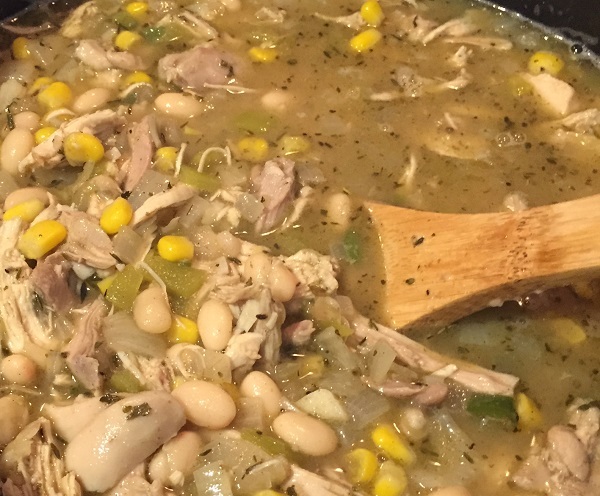 Add the chicken, green chiles, broth, and 1 can of beans. 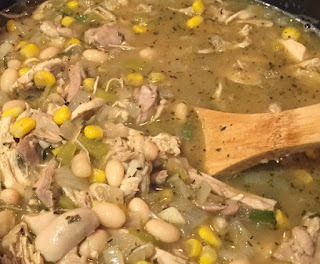 Bring to a low simmer and cook for about 15 minutes. Meanwhile, mash the second can of beans – place in a small bowl and mash with a potato masher or fork. Add the mashed beans and corn to the chili. As soon as it's back to a boil, it’s done. Ladle into bowls and garnish as desired.